Our passive journey #7: Is our proposed house too big? 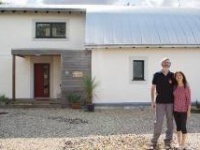 An oversized passive house may be no more sustainable than a correctly sized house built to a more modest spec. 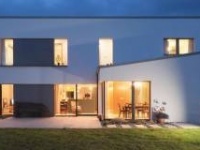 In the latest instalment of her journey to build a passive family home, Nessa Duggan finds that visiting some real passive houses may force a change in approach regarding size and complexity, with potentially significant cost benefits. During Easter break in the sunny south east, we were fortunate to visit two recently completed insulating concrete formwork (ICF) passive houses. The new homeowners were kind enough to share their experiences from start to finish and talk about the thought processes throughout their projects. One was a family with three young children, and the other was at the stage of grandchildren visiting. Both very relevant to our situation in planning a forever home. Physically walking around these houses, chatting with people at the end of the process we were starting, was invaluable to us. Sharing experiences of everything from window sills to attic hatches, balancing priorities throughout the planning, tendering and building processes brought fantastic insight. At circa 240 sqm, both houses felt very spacious – more than adequate for our needs. This confirmed something we suspected, the 292 sqm house in our planning permission was too big. Having grown up in a rambling 370 sqm house, large was not on my list of priorities. During the tender process for our self-build project, issues arose regarding construction of the design, including challenging airtightness details with sliding glazed doors, the support of a roof overhang, rainwater drainage from the roof through the centre of the house and the necessary addition of an ancillary heat source due to the large volume / floor area. 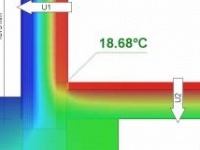 All these issues added unnecessarily to the challenge of achieving the passive house standard. The resounding advice was clear: if you want to achieve passive standard, keep it simple. The growing list of complications and compromises brought us to the conclusion that our project was anything but simple. Having drafted a detailed brief at the outset, somehow along the way we lost sight of our vision, and hadn’t revisited this brief since drafting it. We got excited by the plans initially presented by an architect we hired and unfortunately ignored the fact that they did not align with our vision. This proved to be a very costly oversight in both time and money. A year down the line and better equipped with practical advice, we decided to realign the project to the original brief. We set about modifying the plans with the original headline of 250 sqm max and an aim to eliminate the construction and energy balance challenges. Without furniture to scale included, we had difficulty getting an appreciation for floor areas from planning drawings. We consulted an interior designer to discuss internal layout of living areas to address this concern. Armed with our original brief and existing house plans, we came away with a revised kitchen / diner layout with amendments to the position of doors and windows lined up with the internal flow of living space. Placement of windows carefully considered natural lighting and facilitated effective natural ventilation. Revised construction drawings integrated the interior designer’s advice, simultaneously addressing construction and energy balance complications. A detailed kitchen / diner plan gave us confidence to rationalise the use of space and reduce the floor area by 48 sqm in the single-storey section of the house. The reduced footprint combined with removal of vaulted ceilings greatly reduced the volume to floor area ratio that necessitated an ancillary heat source. A simplified roof design eliminated the need for complicated rainwater drainage. The ratio of window to floor area reduced from 25% to 15% overall by removing a large proportion of the glazing in the kitchen. 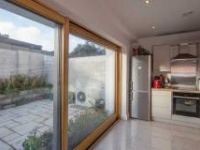 Removal of floor to ceiling glass with sliding doors addressed airtightness challenges and improved privacy to the kitchen from an overlooking property to the rear. All these changes brought the added bonuses of increasing the garden area and significantly reducing the cost of glazing. Construction would be more straightforward and the main living area much cosier. On presenting drawings of the proposed changes to the local planners, the advice was to submit a new planning application, so that’s the next step. To move forward with conviction, again we need to take two steps back.